This is an interesting shipwreck cover. 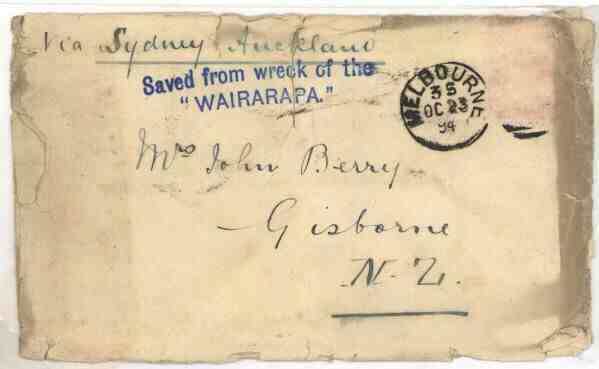 More about the wreck of the Wairarapa on October 29, 1894, can be found here. The cover shows the effects of dunking in the Pacific. Note that the stamp soaked off in the water. It would have been a stamp from Victoria. It is interesting to note that the stamp soaked off but the ink didn't run. for the Tasman Sea transit from Sydney to Auckland. easternmost city in New Zealand where the new day starts.